Eric Johnson is a soul survivor. A 40 year career that has afforded him the opportunity to travel the world performing with some of the world's greatest jazz artists. 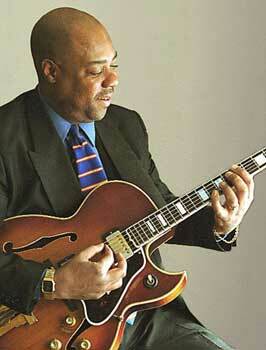 Johnson's career began in Pittsburgh's late 60's Rhythm and Blues/Jazz Funk circuit. After graduating high school, a bold, eager Eric Johnson went on the road with legendary organist Brother Jack McDuff. Johnson soon became a popular sideman working with Leon Spencer Jr., Lou Donaldson, Jimmy McGriff, Stanley Turrentine, Hank Crawford, Ramsey Lewis and many others. After relocating to New York in 1978, Eric began touring with Jimmy Owens and Willis"Gatortail" Jackson. The association with Owens was especially gratifying because of the exotic locations they would perform. The group also conducted many workshops and lectures at various colleges and public schools. Eric also led a trio that worked the New York - New Jersey area. The year 1993 represented a breakthrough in Eric's career, the release of his first CD,"Bumpin In LA" . Due to the success of the CD Eric relocated to the Los Angeles area. While in L.A. Eric led a popular trio in addition to performing with LA greats Lorez Alexandria and Buddy Collette. Eric returned to Pittsburgh in 1996 he stayed busy working with local legends Walt Harper and Harold Betters. Also Eric's second CD Makin’ Whoopie was released. Eric then reformed his favorite group "The Fabalous A-Team. The turn of the century marked a new chapter in Eric’s life, a return to the New York area. Since 2000 he has been performing with old friends Dr.Lonnie Smith and Lou Donaldson on occasion. Most recently Eric has been recording and touring Japan with organist Akiko Tsuruga. Last year in Japan Mr Shiino of Vestax D'Angelico guitars awarded Eric a beautiful guitar and endorsement. Eric new CD"Supahighway” is a labor of love, a beautiful work of art by a group of longtime friends.